Maps have always been at the heart of human knowledge. Whether they chart a newly discovered land or lay out a complicated process, maps serve to improve our understanding of what surrounds us. Maps make the complex simple, and reveal the complexity behind the apparently simple. 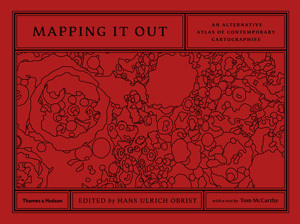 Mapping It Out invites artists, architects, writers, and designers, geographers, mathematicians, computer pioneers, scientists, and others from a host of fields to create a personal map of their own, in whatever form and showing whatever terrain they choose, whether real-world or imaginary. Over 130 contributors’ ideas are represented, including Yoko Ono, Louise Bourgeois, Damien Hirst, David Adjaye, Ed Ruscha, Alexander Kluge, and many more. Some contributors have translated scientific data into simplified visual language, while others have condensed vast social, political, or natural forms into concise diagrams. There are reworked existing maps, alternate views of reality, charted imaginary flights of fancy, and the occasional rejection of a traditional map altogether.